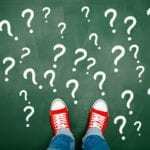 The Luck of the Irish – Sundin Associates, Inc. While the country recovered from 1987’s Black Monday, Joseph M. Murphy, a second-generation Irishman from New York joined the board of directors of a new bank in Carmel, New York. Within four years of joining the board, he became the Bank’s controlling shareholder and, with experience in investment real estate, led the Bank’s growth and expansion into New York City. 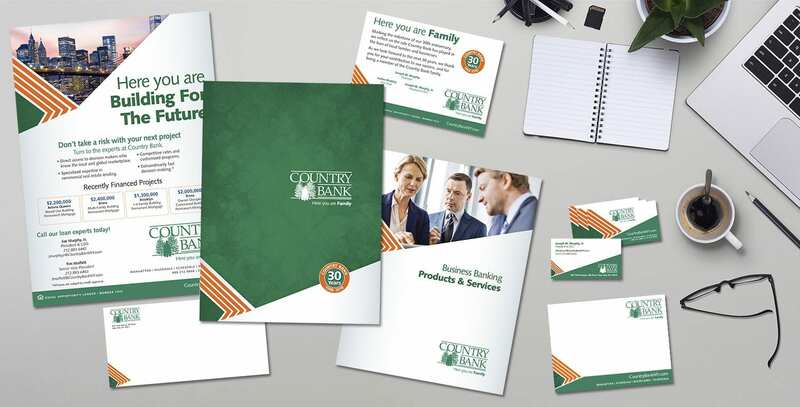 Today that organization, Country Bank, which continues to be led by Mr. Murphy and his family, is a regional leader in the commercial real estate lending business serving the New York City metro area. Approaching its 30th anniversary, and deciding it needed a refreshed brand to take the organization into the future, the Bank turned to another family business with Irish roots, Sundin Associates. Our first recommendation was to reinforce the Bank’s New York connections through imagery, as well as the introduction of a new domain, CountryBankNY.com. Starting with the theme “Here you are Family,” we expanded the messaging to include headlines reinforcing local connections while promoting a range of products and services. As part of the full brand relaunch, we worked with Zero-In to replace the existing video merchandising in all of the branches with a new refreshed deck reinforcing the messaging from the window signs and other collateral. 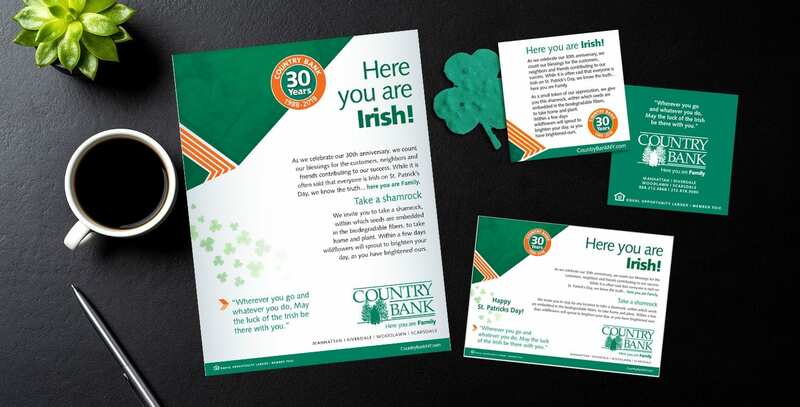 Using the Bank’s existing logo and primary color (green), we created a design scheme that paid homage to the founder’s Irish heritage both through a new color scheme and the use of a shamrock pattern in the background. Perhaps it’s no surprise, given its Irish heritage, that the Bank continues to be a significant supporter of the Irish community and activities such as the New York City St. Patrick’s Day Parade. Launching the new branding in March, a month where “everyone is Irish” due to St. Patrick’s Day, gave us the opportunity to have some fun and engage visitors to the office and at events with a special giveaway. 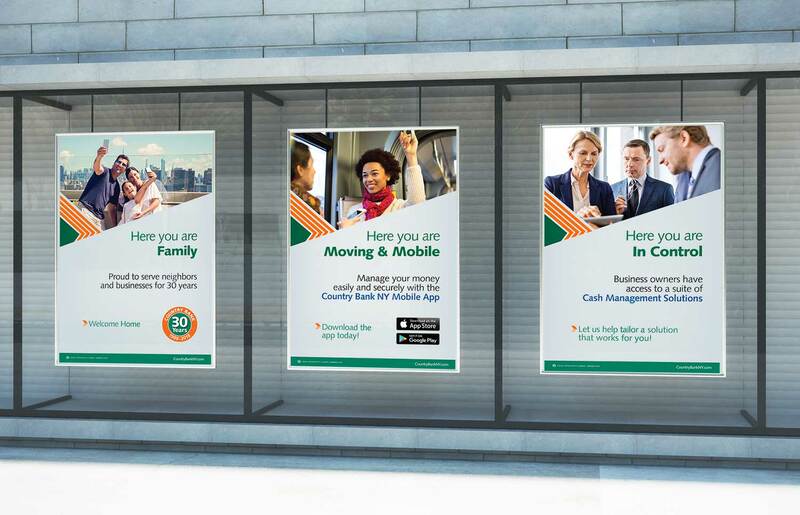 With the new brand successfully launched, we will continue to work with the Bank to integrate the branding to additional channels including their soon-to-be-launched website, as well as working with other partners to ensure the “luck of the Irish” extends to all messaging.